Pills aren’t the only way to relieve minor aches and pains. A slew of over-the-counter patches, foams, sticks, sprays, and roll-on pain relievers (known as topicals) promise to relieve your minor aches and pains. But is a topical treatment right for you? 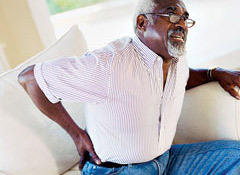 If you suffer from back or muscle strain, or joint pain from osteoarthritis, these topical treatments might provide an alternative to swallowing acetaminophen (Tylenol), aspirin, ibuprofen (Advil), or naproxen (Aleve). Though there are lots of new products on the market, some of the drugs found in them have been around for decades. But there isn’t a ton of current research about how well they work. A few studies suggest that they can offer relief for some people, and other studies have shown they may not help at all. If you are in pain and are curious about trying one of the topicals out there, read on to find out what you need to know based on the latest research. Common ingredients include menthol, camphor, capsaicin (found in chili peppers), and methyl salicylate (oil of wintergreen). Some of the products are claimed to have a heating or cooling effect. The ones with capsicum or methyl salicylate create a feeling of heat, and the ones containing menthol cause a cooling sensation. Those ingredients are called counterirritants. They work in an odd way—the active ingredients actually inflame the area near the pain point, and that stimulates the nerves and creates a new, milder sensation. So essentially they are distracting you from the more intense pain you’re trying to treat. Though no one is sure exactly how that works, one hypothesis is that in some cases the drugs may increase blood flow to the area. Your doctor may recommend a prescription topical pain reliever. Diclofenac gel (Voltaren), drops (Pennsaid), and patches (Flector) are all NSAIDs—nonsteroidal anti-inflammatory drugs, such as ibuprofen or naproxen. Topical NSAIDs may be a good choice if youu’re at risk of heart attack or stroke because they allow lower levels of the drug to enter the body than with a pill. (NSAID pills may put you at higher risk of those problems.) Studies suggest that topical treatments also may cause fewer instances of internal bleeding than do NSAID pills. But more studies are needed to confirm that. Topical painkillers can be used a day or so after a minor muscle injury, with your doctor’s OK. The first thing to do after such an injury is follow the RICE formula: Rest, Ice, Compression, and Elevation. Here’s how: First, rest the injured body part. Ice the area four times a day, for 10 to 15 minutes, for one to three days. Then compress the area by wrapping it with an elastic bandage. To lessen swelling, elevate the injury, if you can, above your heart for a few hours a day. Once the swelling is gone, after 48 hours, switch to heat. Use a warm compress, heating pad, or hot-water bottle to improve blood flow and help remove old blood from the area. Never use a heating pad after you’ve applied a topical product because that combination can increase your risk of burns, according to our medical advisers. The Food and Drug Administration warned about that last year. Also, don’t apply topicals containing methyl salicylate before you exercise because your body could wind up absorbing too much of the active ingredient, presumably because exercising increases your circulation. Always follow label instructions because topicals can come with some risks. For example, using topicals too often or leaving them on too long can make your skin prone to allergic reactions. If the patch you’re wearing begins to burn or itch, or your skin turns red, stop using the product and check with your doctor. That applies even if you’ve used the same product without a problem in the past. To minimize your risks, don’t use topicals on any areas of the body where you have an open wound or broken skin, even a scratch. And never cover the area with bandages. The FDA has said that dozens of people have experienced mild to severe chemical burns from the use of some topical pain relievers. If you find that none of the topicals you try helps to relieve your pain, don’t simply use more, thinking that more is better. Overdoing it could put you at a greater risk of burns. It’s hard to predict who might have a bad reaction, but here is a standard caution: Pregnant women, infants, children, senior citizens, and people with sensitive skin may be at higher risk for problems.